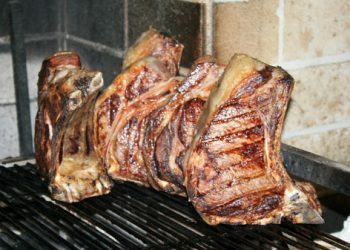 October in Umbria is a great time to enjoy nature’s bounty including wild mushrooms, chestnuts, and of course truffles. 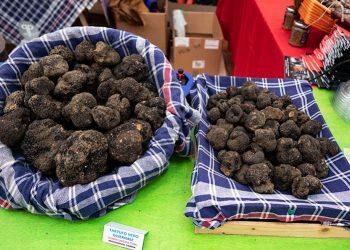 For the next month or two there will be truffle festivals held across Umbria, and unfortunately since we are leaving Umbria a little earlier than usual, we will miss them all. 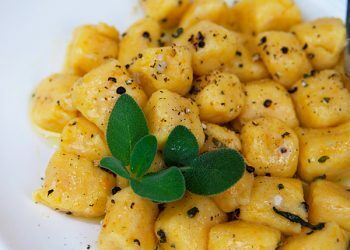 We do have a few connections to fresh truffles, and are lucky to almost always have them on hand. 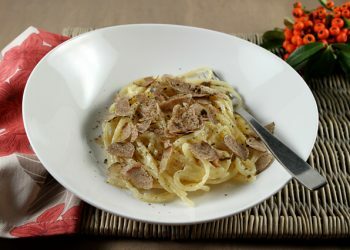 When we are given fresh truffles, we will usually enjoy them on top of fresh pasta the day we receive them. 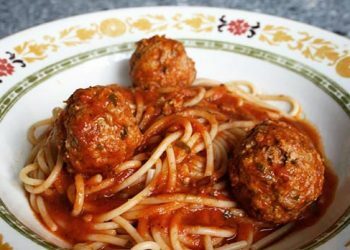 The rest we shave, mix with olive oil and freeze in small bags to enjoy later. 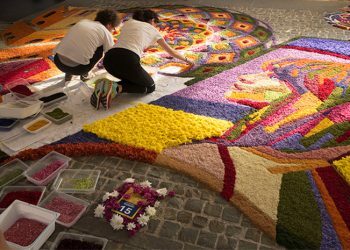 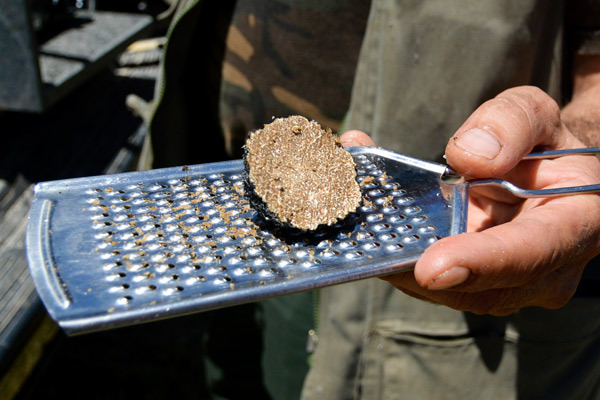 One truffle festival we try and attend each year is in Pietralunga, a small town in northern Umbria. 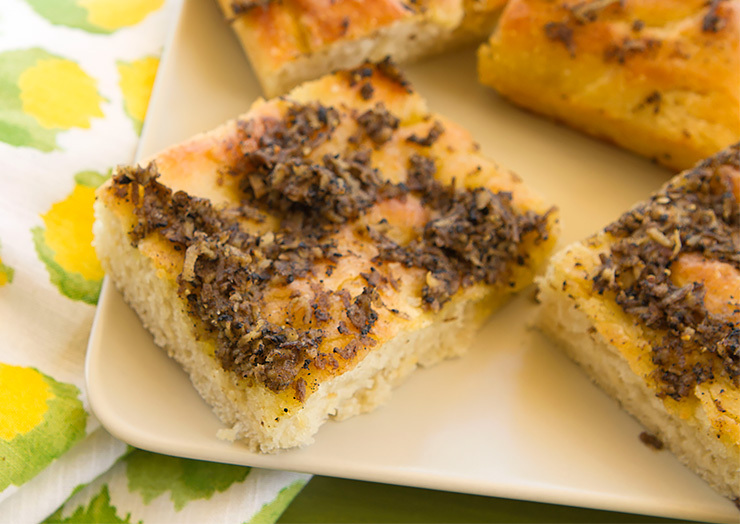 The first thing we do when we reach the town is to head to the bakery where they sell slices of warm focaccia topped with black truffle paste. 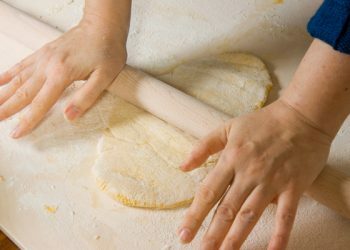 The truffles lose their aroma when cooked, so the paste is spread across the flatbread after it has been baked, and while it is still warm. The warmth of the just baked bread enhances all that truffle goodness creating an intoxicating scent. 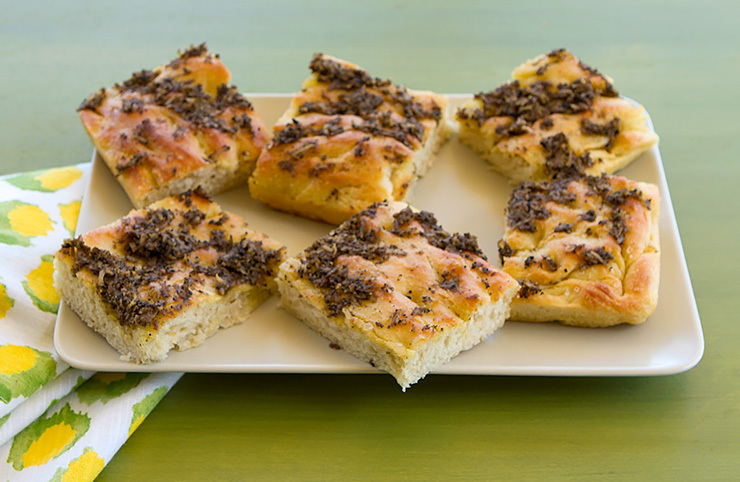 I understand completely that most folks do not have fresh black truffles available to them, but I have made this focaccia back in the states using truffle paste, or tartufata sold in jars with very good results. 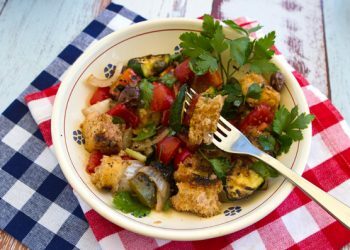 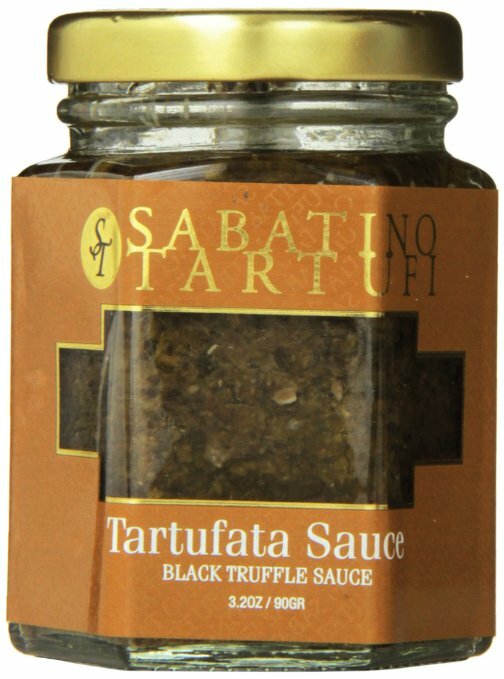 Tartufata is a blend of black truffles and mushrooms that is delicious and can be used in place of fresh truffles when they are not available. 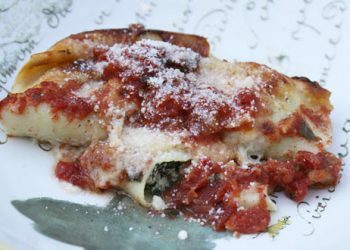 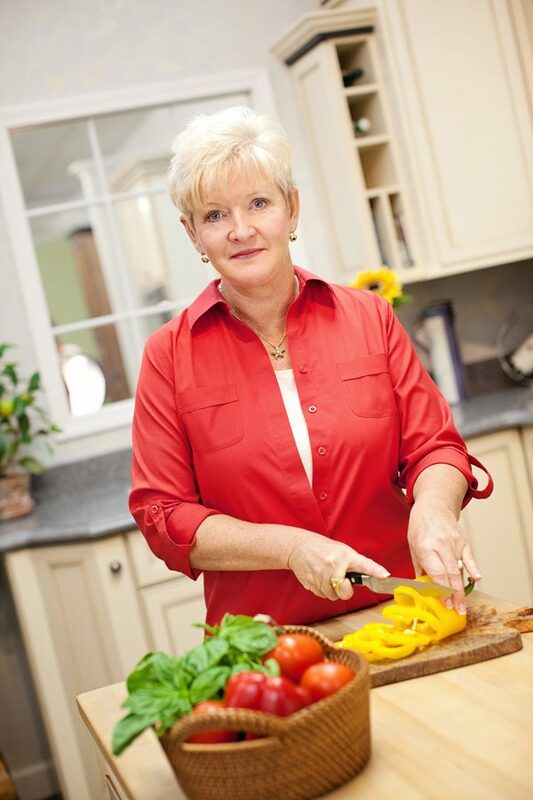 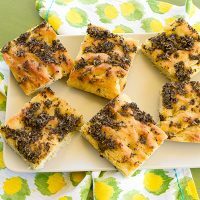 You can buy a good quality brand of tartufata now in many specialty food stores such as Whole Foods and through many online sources such as Amazon.com (See Link Below) or Click On Image For More Details On Ordering). 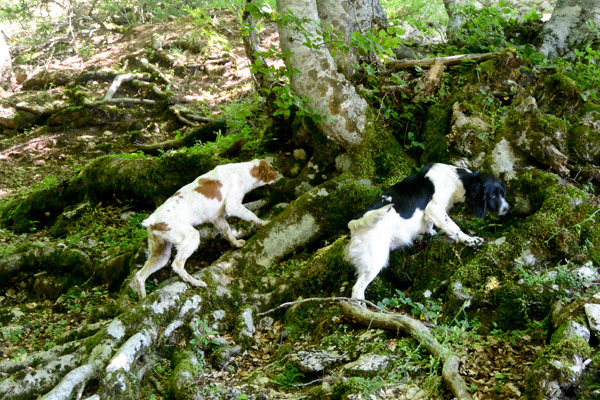 Dogs hunting for black truffles. 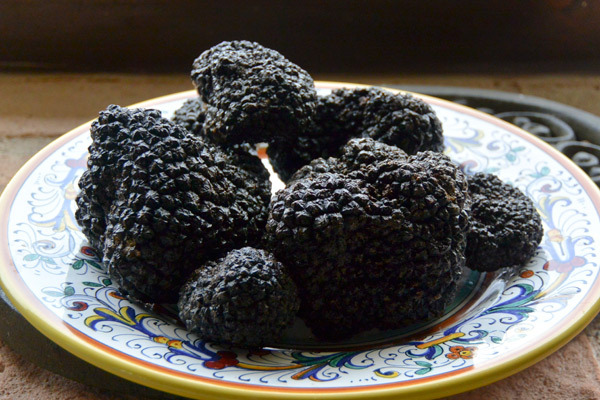 Our recent black truffle bounty. 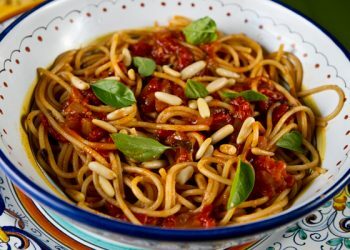 Drizzle about 1/3 of a cup of olive oil over the top. 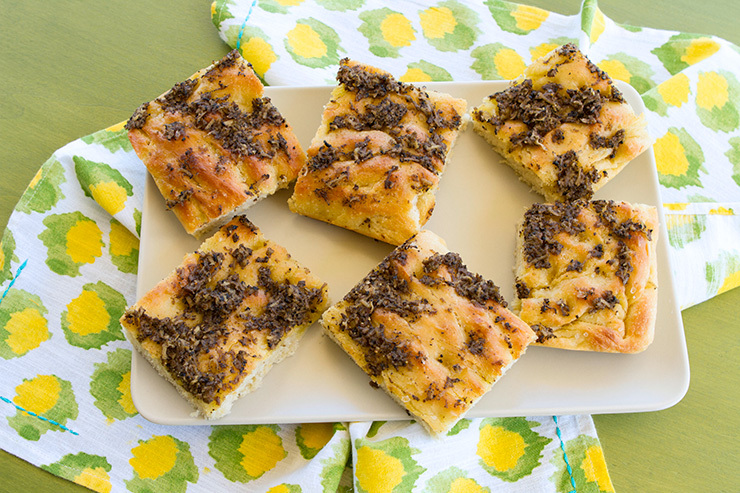 After the focaccia comes out of the oven, spread the tartufata or truffle paste over the top. 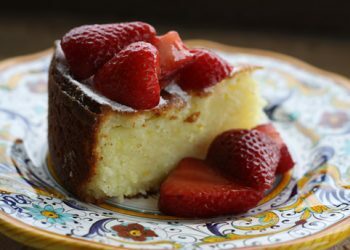 Let cool 10 minutes then slice and serve.